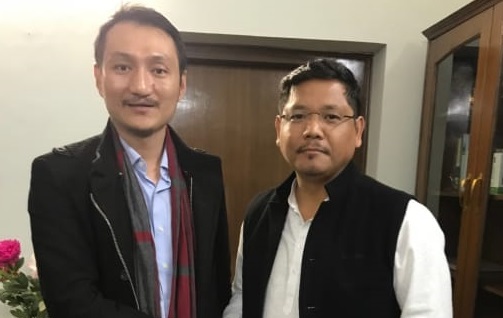 Amid the hullabaloo over the Citizenship (Amendment) Bill, 2016 that has rocked the streets from the north-eastern states to the national capital, a BJP leader has showered all praises on Meghalaya chief minister Conrad Sangma for his opposition to the bill. In a surprise move, the national secretary of BJP’s Schedule Tribe Morcha (STM), Hayithung Bill Lotha has lauded Meghalaya chief minister, Conard Sangma, for taking ‘very bold and fearless initiative’ against the Citizenship Amendment Bill, 2016 and successfully ‘stalling/thwarting’ the Bill in Rajya Sabha. In a press statement issued on Saturday, Lotha said Conrad was ‘unanimously and overwhelmingly’ being hailed as an ‘iconic NE Hero’. 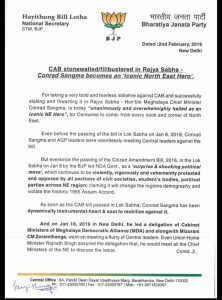 He also said, even before passing of the Bill in Lok Sabha on January 8 last, Sangma and AGP leaders were relentlessly meeting central leaders against the bill. Further, Lotha said Sangma chaired a ‘historic meeting’ of 11 political parties to oppose the Bill. 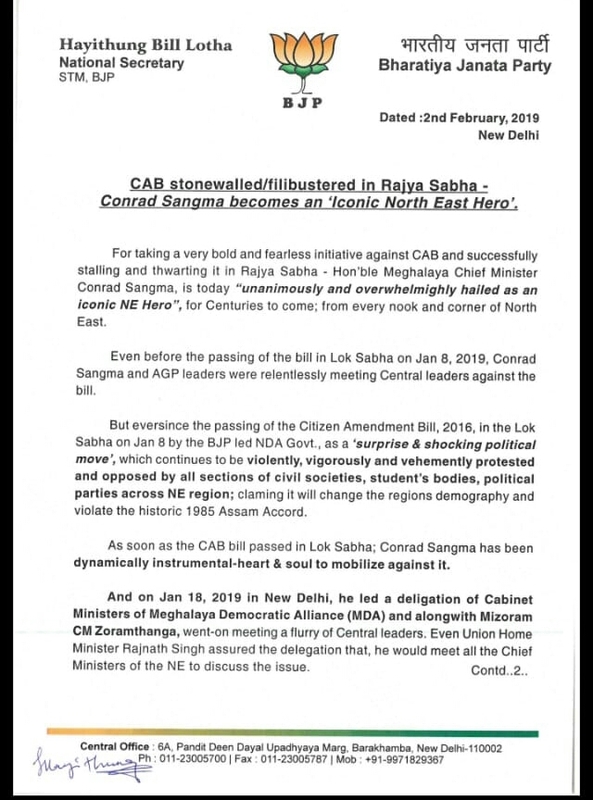 Due to Sangma’s relentless hard work, the BJP-led NDA government has not officially listed CAB in the Rajya Sabha agenda list in the current budget session, he added. On the other hand, leaders of 11 regional political parties from north-eastern states is meeting Union Home Minister Rajnath Singh on Sunday to press for their demand to withdraw the Citizenship (Amendment) Bill that has already been passed in Lok Sabha. The Bill, however, has not been listed in the business of the current Rajya Sabha session that will end on February 13. Meanwhile, BJP’s ally Janata Dal-United (JD-U) claimed that due to opposition from the party, the controversial Citizenship (Amendment) Bill was not tabled in the ongoing Rajya Sabha session. JD-U general secretary in-charge for Northeast, Ahmad Khan, on Saturday claimed that due his party’s opposition, the NDA government was pressurized not to bring the bill in the ongoing last session of the Rajya Sabha.